A decade ago I read an interesting piece of non-fiction: Howards Marks is a charming Welsh author and (former) drug dealer. He wrote a book about his drug-related exploits called Mr. Nice. Interestingly enough, he began selling drugs while attending Oxford and studying philosophy. At one point, he makes an aside comment, a la Good Will Hunting, that you can learn more from some library book than you often can from the fabled halls of academia. 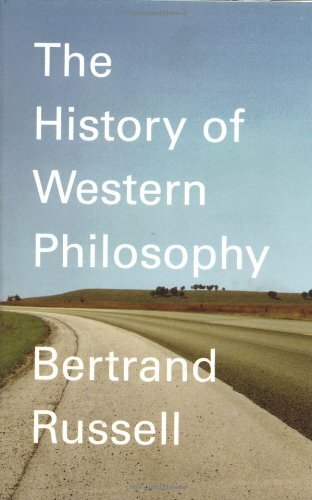 Marks’ recommendation of Bertrand Russell’s expansive yet accessible The History of Western Philosophy stood out to me as a must-read. The book was pitched as a single volume tool for the amateur philosopher (a.k.a. me). I bought the book a decade ago but never had the courage to crack the binding of its 900 pages. However, at the end of the last CBR, I decided that 2016 would be the year of the bucket list books. First up was Russell’s Western Philosophy. I started reading in December of 2015 and just finished yesterday. Essentially, the weighty (but spry) volume was a semester-length survey of western philosophy. Eastern philosophy is not included as a matter of scope but is occasionally mentioned, especially in relation to how the Dark Ages wasn’t that dark worldwide. While the book is intimidating, I found it to be a (mostly) charming ride because I appreciated the mental workout and because the the author’s affable voice. Bertrand Russell was a British Nobel prize-winner who lived in the 19th and 20th centuries. He was married four times and was a Renaissance Man. I found his writing charming. Russell, in the style of a cheeky docent, takes the reader on an intellectual tour of everything from the pre-Socratics to John Dewey (the book was finished around the time of World War II). As Russell himself readily mentions within the first few pages, he is not writing as a narrow expert on any of the philosophers covered; others know more about the subject of each chapter. Rather, Russell’s goal is to specifically look at philosophers in the context of history and culture. He believes that philosophers are influenced by and influence their time. He disagrees with those who say that philosophers are merely yes men to justify the actions of those in power. Additionally, he does not pretend that eccentrics with leatherbound books and metaphysical ideas are the levers that single-handedly move human history and development. This approach led him to include a lot of history and context for each of the dozens of philosophers covered. While it took me months to finish the book, ultimately I found it edifying and worthwhile. My particular leanings made the pre-Socratics particularly interesting. For example, there is something beautiful about Anixaminder’s elemental justice, and Empedocles’ cycle of Love & Strife. Equally useful, if not as elegant, was Russell’s look at some of the great Catholic philosophers and how they attempted to reconcile intellectual and scientific achievements with their faith and cosmology. Russell is often frustrated by clumsy attempts and prefers to acknowledge that some things are outside the realm (scope) of science and likewise theology is not particularly useful for all questions. My personal interest in philosophy (which the author defines as something intermediate between religion and science) is in ethics and metaphysics. Reading The History of Western Philosophy forced me to think about how many of my political and cosmological beliefs in particular are not eternal, but rather came from certain men during a certain time. Of course I already knew that on paper, but internalizing it was helpful to me in that it reminded me that we need philosophies and ethical systems for our time, made by us to address our issues. Russell repeatedly cautions the reader that one can respect ideas or their authors too much, and that respect can stifle creativity and lessen the desire to search for truth. That’s what philosophy is for me – the search for truth. My best definition of philosophy (as a whole) is “engagement with life’s big questions”. I think we should be looking for what is true and good and answer life’s big questions using what we find. If that’s your bag, consider this book. Share the post "“This may seem odd, but that is not my fault.”"
Well, if I hadn’t already been thinking of adding this book to my to read list during your review, you certainly got me on board there. I work with docents, and I can’t emphasize to them enough that their personality, and what they bring to the story they are telling, is as important as anything else. Same for authorial voice.